Easily extend Microsoft SCCM to patch over 320+ third-party updates across 180+ common enterprise products. Let us handle the tedious work of packaging, testing, deploying, and troubleshooting application updates in your SCCM environment. Save time, money, and stay secure by automating the publishing of third-party updates to your environment. 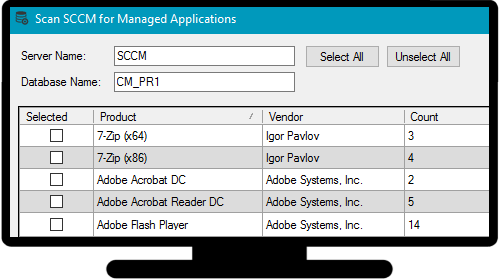 You can even configure automatic deployment rules in SCCM for complete control and automation over third-party patch management in your enterprise. Initial setup only takes minutes. Try it today! In addition to third-party patching, we can create base installation packages for the initial deployment of applications to your SCCM clients. We’ll keep the base installs up to date automatically — no need to deploy outdated apps and wait for the updates to apply after the fact. Use existing installation methods within SCCM including task sequences and collection deployments for the initial installation of products. Let your SCCM administrators handle more significant matters rather than the mundane task of packaging saving time and money! Add your own custom pre/post update scripts to perform environment specific configurations when needed. Disable the self-update feature within applications to ensure you can manage when and how updates apply in your enterprise. Automatically close application processes before performing updates. Enable installation logging for updates and save the logs to a standard folder. If updates fail, you will know why not just an exit code of 1603. Add custom command lines when needed to customize your installations. 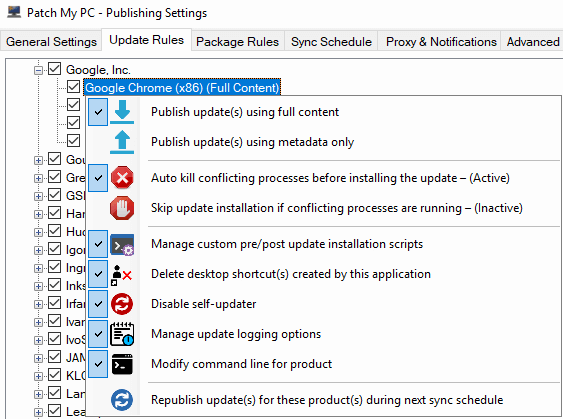 Remove desktop shortcuts after applications are updated automatically. Use existing SCCM site systems to scale. Get insights on update compliance with our included reporting dashboards. Email, forum, and phone support are included. Stay informed using our newsletter and RSS feed containing CVE IDs. No additional server or client agents required. Save time and money by reducing manual application packaging. Do you have questions? Get answers to questions about resellers, discounts, multi-environment, client increases, support options, excluding devices, subscriptions and more! Please fill out the quote request form below. Quotes are generally sent within a few hours of us receiving the request. If you are a reseller, please answer Yes in the quote form popup. Looks interesting, why don’t you try it out in your environment? We have a free trial catalog that you can use for evaluation purposes. No sign-up forms required to download and install the free trial! We currently support 325 third-party updates across 180 unique products and always open to adding more based on customer value. Customers can request new products on our forum. Don't Take It From Us - See What Our Customer Are Saying! Prior to using Patch My PC’s catalog, I used to spend hours porting updates into our environment taking time away from my other administrative tasks. Now I no longer have to keep on the lookout for new updates and scramble to add it to WSUS. The value is quickly realized in my work hours making this subscription easily pay for itself. The Patch My PC catalog has saved me so much time. 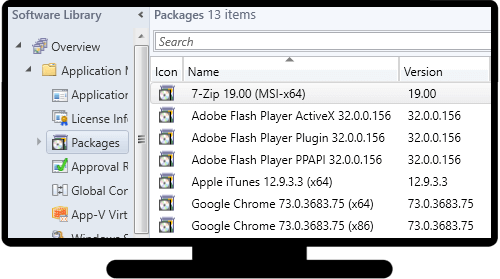 I used to spend so much time packaging Java installations every time there was an update. I was pleased to learn that I could also keep Skype, Zoom, Audacity and other applications that we use up to date also. I spend a fraction of the time I used to have to spend on updates. It is the best spent money in my budget. If I was unable to get our subscription approved, I would pay for it out of my own pocket. Don’t tell my boss. We are very satisfied with the product and the service we receive. We have had suggestions to add to the catalog and within a few days they were available. Good and solid product. We would highly recommend “Patch My PC” for SCCM/WSUS integration. We currently support 326 third-party updates across 180 unique products. We are always looking to add quality applications to our catalog for our customers. Customers can review the application request and create a new application request on our forum: Request New Software. In fact, the majority of supported applications have come directly from our customer request! 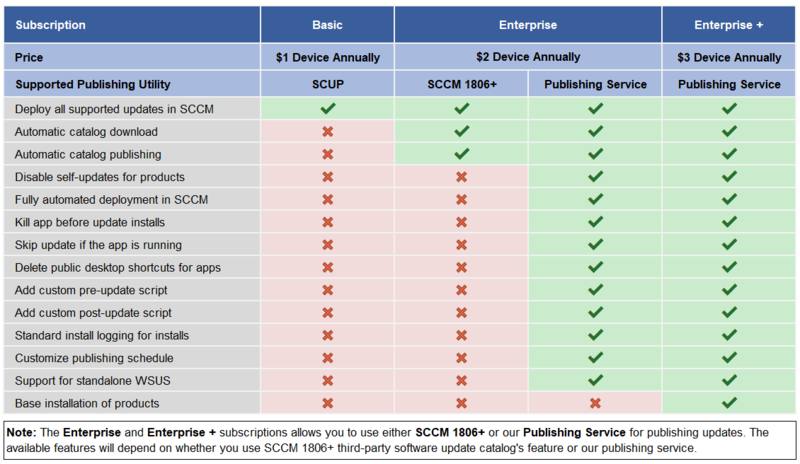 A full list of supported products for our Update Catalog for Microsoft SCCM is listed below. You can expand each application by clicking the + symbol to see all the versions, variations, and architectures of each product. 1 The product isn't supported due to the vendor discontinuing the product. You can contact us for the last available version if needed. 2 The product doesn't support base installations.